Because of the diagnosis of heart problems at the ultrasound we were put in the hands of the fetal maternal medicine unit at the hospital. This meant scans every couple of weeks to check everything was OK. With what was to come this turned out to be very lucky. 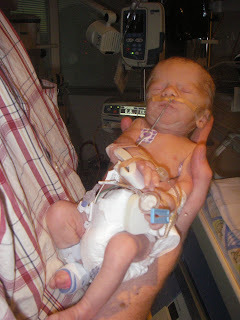 Without the heart defects we would have carried on oblivious to anything and the outcome may have been very different. Initially Finlay seemed to be doing well. Each two weeks we got to see the little guy developing and hear his heart pumping away. Despite the underlying problems all seemed well. We started to look forward to these extra ultrasounds. A silver lining to the cloud of his heart condition. It was about the beginning of the third trimester at the end of another seemingly successful appointment, the sonographer was making all the measurements for Finlay's notes: head circumference, abdomen size, leg length, etc when she noticed that he was a bit on the small side. Nothing to worry about, just a one-off measurement. It would probably be back to normal at the next scan. But it wasn't. Although his heart seemed to be beating away happily he had hardly grown. They couldn't find any reason, everything else seemed to be fine. At each of the now more frequent scans his heart took backstage to the new problem of his lack of growth. Early intervention was mentioned. As long as his heart seemed strong they thought he'd be ok but his size was the real concern. In New Zealand all the paediatric cardiologists are in Auckland, an hours flight away on another island. With his heart problems Finlay needed to be born there in case he needed urgent surgery. After 36 weeks the decision was made to get Vicky on the plane. During the last few years we've seen the best in people. The world can seem a harsh place with the daily dose of war and crime on the news but we've experienced the kindness and willingness to help those in need that makes us human. In Auckland, Vicky was confined to the maternity ward while I was staying in a motel about a mile away down the hill in Newmarket with our other two sons, then 2 and 5. Dragging two bored children who just wanted to stay with mummy back and forth from the motel to the hospital just added to the stress around the birth. But then a lady working in the Auckland office of Vicky's employers turned up with a spare car for us to use, a family we had never met but was related to Vicky's work colleague offered to take the boys when we needed, two friends living in Auckland gave up their time to help out where they could. To all these and many others we will be forever grateful. After a week in the hospital the doctors decided it was time to get the little man out so Vicky was induced and in the early hours of the next morning Finlay made his appearance. With all the uncertainty about his heart and doctors unable to explain why he had stopped growing we had no idea whether he would come out alive, whether he would be whisked straight off for surgery or what the next few days would hold for us. When he came out and gave a full-blooded cry it was amazing. The anxiety evaporated as he showed he was meaning to stick around for a while. He was small, but he was alive. After a quick cuddle with mum, he and I were whisked away to the neonatal unit for the start of what would be a long stay. His heart seemed to be stable and all signs were good. His initial blood glucose was low, 1.9 mmol/l (~34mg/dl) so he was given IV dextrose. Those numbers meant nothing at the time and blended in with the dozens of other figures and measurements that were thrown around. How that was going to change in the coming days and weeks!! But I'll save that for part 3.